What is a TO Package? The increase of power capabilities for transistor technology lead to the development of device packages capable of dissipating much greater amounts of heat. These specialized packages are referred to as transistor outline, or TO package. The high-power versions of these packages have been adopted by other types of components as a convenient way to enhance thermal performance. The most common packages utilized by resistor manufacturers are (in order of power capabilities) the TO-263 (D2PAK), TO-126, TO-220, TO-247, and TO-227. 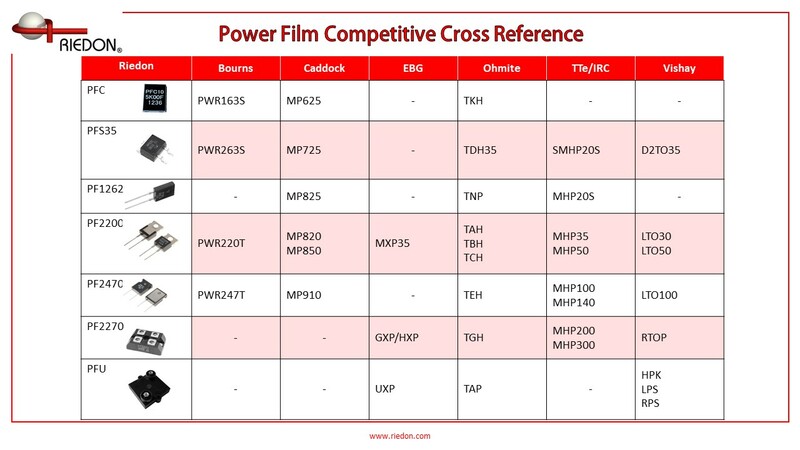 The TO packaged devices are among Riedon’s fastest growing product lines and cover power ratings from twenty to six hundred watts or more in a single package. A wide array of applications. These packages are used in a large number of products including theater lighting, fuel cells, precision welding equipment, EV battery charging, motor drives, inverters and other power conversion equipment. Proper thermal design is key to optimizing the capabilities of Their compact size allows for several heat sinking options to facilitate exceptional power handling for their size. Yes, we probably have a cross for that. The attached sheet provides a condensed cross reference of some of our main competitors’ products. The list is in no way exhaustive, but will provide a quick guide to the various product lines available from manufacturers and the depth of coverage in this fast growing market segment.